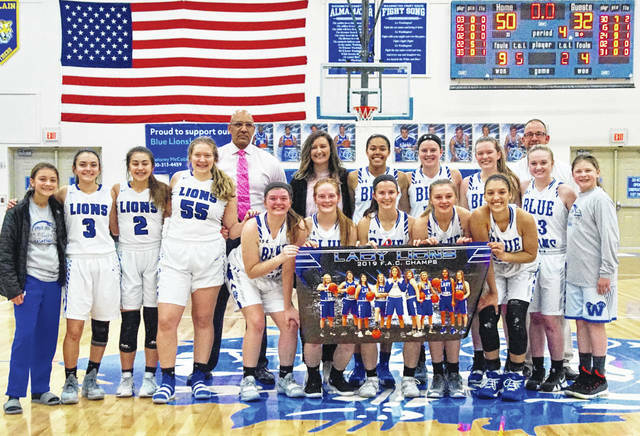 2018-19 FRONTIER ATHLETIC CONFERENCE CHAMPION WASHINGTON LADY BLUE LIONS — The Lady Lions won the FAC title outright Monday, Feb. 11, 2019 with a 50-32 victory over the McClain Lady Tigers in a game played at Washington High School. In front (l-r); seniors Maddy Jenkins, Tabby Woods, Kassidy Hines, Bre Taylor and Hannah Haithcock; second row (l-r); Leah Marine, Mia Moats, Aaralyne Estep, Haven McGraw, assistant coach Mychal Turner, head coach Samantha Leach, Rayana Burns, Shawna Conger, Halli Wall, coach Corey Dye, Abby Tackage and Karris Dye. Not pictured: team manager Joey Pickelheimer. Washington senior Hannah Haithcock puts up a shot against the McClain Lady Tigers in a 50-32 victory that secured an outright Frontier Athletic Conference championship for the Lady Lions. Also pictured (l-r); Kyla Burchett, McClain; Tabby Woods, Washington; Bryn Karnes and Liz Kegley, McClain; Haithcock; Jaelyn Pitzer, McClain and Maddy Jenkins, Washington. 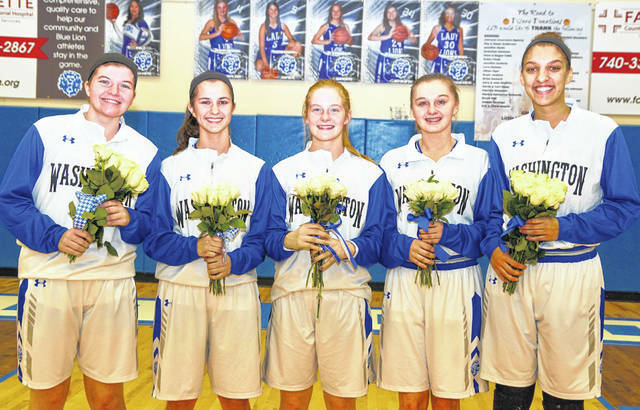 Washington Lady Lion seniors were honored prior to the game against the McClain Lady Tigers Monday, Feb. 11, 2019. (l-r); Maddy Jenkins, Kassidy Hines, Tabby Woods, Bre Taylor and Hannah Haithcock. 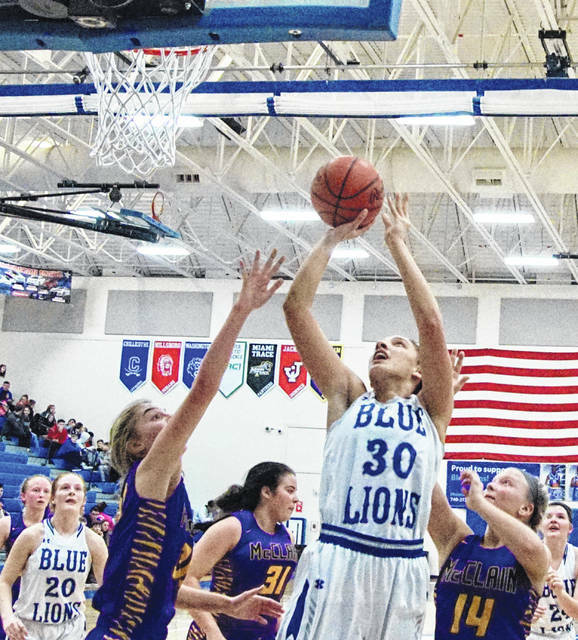 The Washington Lady Blue Lions were looking to secure an outright Frontier Athletic Conference championship as they finished regular season play with a home game against the McClain Lady Tigers on a rainy Monday, night, Feb. 11, in Fayette County. After a somewhat slow beginning, Washington got the job done with a 50-32 victory. Washington finishes conference play atop the standings at 9-1. The Lady Lions are now 17-5 overall. McClain completes FAC play at 6-4, taking third in the conference. The Lady Tigers are 13-8 overall. Senior Hannah Haithcock led the game in scoring with 16 points for Washington. She also had seven rebounds, three steals and three blocked shots. Junior Rayana Burns scored 15 points and Kassidy Hines, Tabby Woods and Halli Wall each added five points. Burns had three assists, seven steals, four rebounds and one blocked shot. Hines had three rebounds, Bre Taylor had two assists and three steals and Shawna Conger had three steals and two assists. McClain senior Kelli Uhrig hit two three-point field goals and finished the game with 11 points. Sophomore Kyla Burchett scored nine points and senior Bryn Karnes had seven points. “I’m just very excited for our program,” Washington head coach Samantha Leach said. “Especially for our seniors. To win the league championship on senior night is truly special. It’s been 12 years since we’ve had a league championship, since 2007 in the SCOL. “I thought the girls did an outstanding job on the defensive end tonight,” Leach said. “We were able to really frustrate them. The girls did an excellent job of putting pressure on the ball and we were able to convert on those turnovers. The lead changed hands four times in the opening quarter with Washington emerging with a 7-5 lead after eight minutes of play. The Lady Tigers pulled to within one point on a free throw by Burchett early in the second quarter. It was as close as the visitors would get the remainder of the game. Washington went on an 8-0 run with a bucket each from Haithcock, Hines, Wall and Burns to take a 15-6 lead. McClain scored the next five points to pull to within four at 15-11. Washington outscored McClain 6-2 in the final two minutes of the half to take a 21-13 halftime lead. The Lady Lions kept up their offensive pressure, making the Lady Tigers work extra hard to get into their offensive sets. McClain was able to cut the deficit to five at 25-20, but by the end of the quarter, Washington had its biggest lead to that point, 37-23. The Lady Lions led by as many as 24 points in the fourth quarter (50-26) before McClain scored the next six points to set the final tally at 50-32. “We played to the best of our abilities with the line-up we had out there,” McClain head coach Jarrod Haines said. “We had no true point guard in the line-up. I thought for the most part we handled their pressure well. Any time you have a young team out there that’s a little inexperienced, they’re going to make some mistakes. “Kelli (Uhrig) was asked to be the point guard,” Haines said. “She did some really good things for us running the point. She gave us everything she had. Jaelyn (Pitzer) did a great job of helping bring the ball up the floor. “We worked hard,” Haines said. “We did everything we could. They’re long, athletic and they gave us problems with their pressure. “Good for them,” Haines said of the Lady Lions clinching the outright FAC title. “They have some really good athletes, some really good basketball players. They have a line-up that’s tough to match up with. That senior class plays extremely hard. They do some really good things — they’re smart. Hats off to Court House, they do have a really good team. McClain will take on the Miami Trace Lady Panthers for a Sectional championship at Adena High School Saturday at 2:45 p.m.
Washington will play for a Sectional championship against Waverly Thursday at Adena H.S. at 6:15 p.m. In Division II tournament action Monday, at Adena High School, Chillicothe defeated Hillsboro, 52-31. Chillicothe will play the No. 1 seed Circleville Saturday at Adena at 1 p.m.
Down at Wellston, the No. 8 seed River Valley beat the No. 9 seed Jackson, 35-27. Next up for River Valley, a date with the No. 1 seed Vinton County Saturday at 1 p.m. at Wellston H.S. WASHINGTON — Rayana Burns 7-1-15; Bre Taylor 1-0-2; Kassidy Hines 2-1-5; Tabby Woods 2-1-5; Halli Wall 1 (1)-0-5; Shawna Conger 0-0-0; Maddy Jenkins 1-0-2; Hannah Haithcock 7-2-16; Abby Tackage 0-0-0; Aaralyne Estep 0-0-0; Mia Moats 0-0-0; Haven McGraw 0-0-0. TOTALS — 21 (1)-5-50. Free throw shooting: 5 of 8 for 63 percent. Three-point field goal: Wall. Field goal shooting: 22 of 45 for 49 percent. Turnovers: 13. Rebounds: 20 (10 offensive). McCLAIN — Cierra Bolendar 0-0-0; Brianna Weller 1-1-3; Jaelyn Pitzer 1-0-2; Macie Adams 0-0-0; Kelli Uhrig 2 (2)-1-11; Kyla Burchett 3-3-9; Bryn Karnes 2-3-7; Liz Kegley 0-0-0. TOTALS — 9 (2)-7-32. Free throw shooting: 7 of 11 for 64 percent. Three-point field goals: Uhrig, 2. Field goal shooting: 11 of 32 for 34 percent. Turnovers: 22. Rebounds: 23.